I always had May Canyon on my mind, but never climbed it thinking if it was so great, why didn’t most people know about it? In my mind, I guessed it was an impassible road that only nutbags dared trying. Finally, a few of us committed as a group to give it a shot until it dwindled down to a pair. Fortunately, the only other guy to stay in was the only one who had a cyclocross bike, which was going to be my preferred choice anyways. As for the metrics, May Canyon is 4.7 miles to the top with a 1847 foot gain in elevation. While the climb seemed daunting, my biggest fear was the condition of the road. 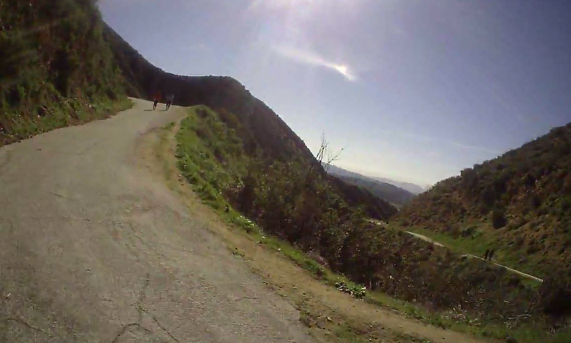 Since it was so sparsely ridden, I imagined Griffith Park’s Vista del Valle, but in much worse shape. The climb starts without giving you a proper welcome. The road is cracked, but not too divoty. There are plenty of hikers along this portion. For the first 1.3 miles, expect the grade to stay in the double digits. Once you’ve finished with the steeper part of the climb, the hikers dissipate in lieu of some slightly more shoddy road conditions. There are dirt patches you can’t avoid, but they are few and far between. 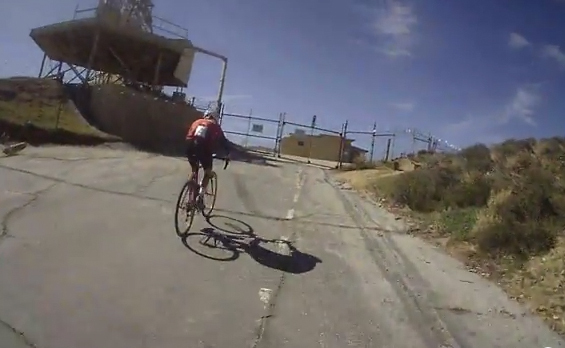 The climb stays in the 6%-7% range until you hit the peak of the May Canyon portion. Fortunately, a few people painted mile markers on the ground, although they compete with each other over accuracy. When you hit the top, you turn right at the intersection to head towards Camp 9. This section is primarily dirt and where you should be more wary taking a 23mm tires out there. 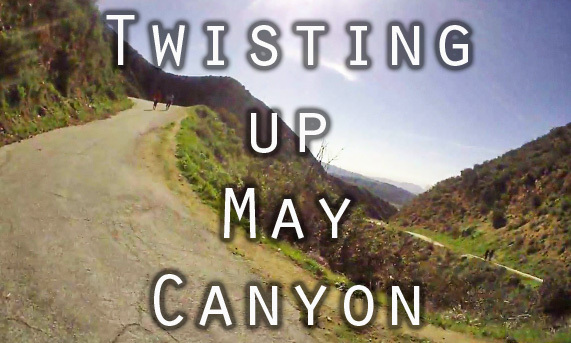 It’s only a 1.5 mile section which alternates with gradual climbs and descents. I had fun riding this part, but glad I took a little air pressure out before the ride. You have an idea where Camp 9 is by spotting one of the antennas far off. Once you come across the base, you might as well take a right hook up the final climb to the Nike facility. Your reward is a pretty comprehensive view of the valley. If you’ve run out of water, there’s a fountain in the middle of the camp, but beware of it’s unpredictable water pressure. I will say to avoid going back down the hill. There’s too many hikers around the many turns for you to pinball off of. Instead, continue past Camp 9 and take Little Tujunga back down. It’s a fun loop and a nice payoff too. State of the City Los Angeles – What is This?